Recently, I thought I should patch one of my vSphere clusters using VMware Update Manager so I started to do a “Scan” for the cluster. However, the process failed soon after starting. 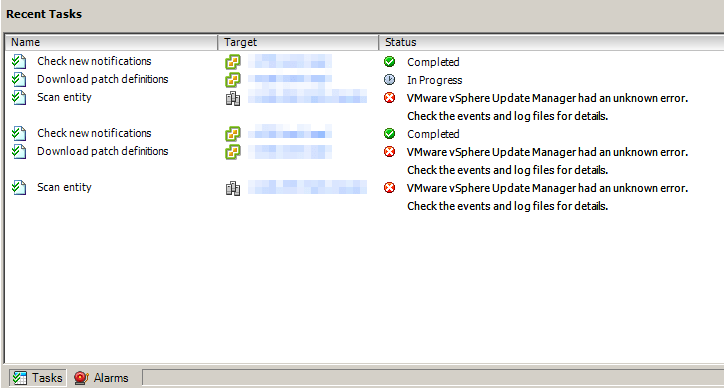 The first thing I noticed was that the “VMware vSphere Update Manager” service was going down with it. VMware vSphere Update Manager had an unknown error. Check the events and log files for details. I started the service and plug-in and tried again, with the same result. At this point, I also noticed that it was failing at 4% every time. Everything seemed normal e.g. repository was accessible using the account so it didn’t seem like a permission issue and service wasn’t falling over until I tried the scan. The “Tasks & Events” tab was as helpful as ever so I thought I should try my luck with the log file. So I went to <%Systemroot%>\ProgramData\VMware\VMware Update Manager\Logs and looked for “ERROR” in the “vmware-vum-server-log4cpp.log” file. Click on the screenshot to see a bigger version. As you can see that it was complaining about not being able to access D:\VMware Update Manager\host_upgrade_packages\esxi-upgrade-zakpguzadv (The last bit will probably be different for you). Curiously, I had the said folder in the repository but not where it was looking. 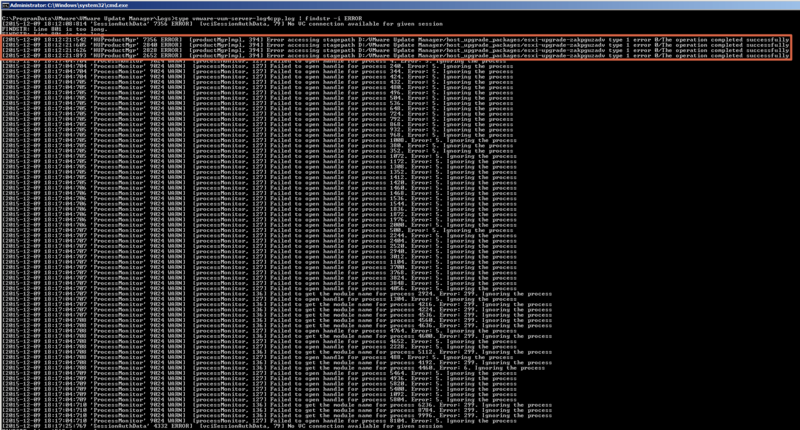 Instead, it was under D:\VMware Update Manager\Data. Now I don’t know when and why the location changed but the result was this error. Apart from that, you can see the other complaints as well but they were understandable, given the service was falling over by then. Because the service was down already and this all looked promising, I just moved the folder one level up (well OK, I copied and pasted, just to be safe) and that was it! As soon as the service started and I enabled the plugin again, I could see “Download patch definitions” moving beyond where it was getting stuck before and I could also see it downloading missing patches. Contents of the folder mentioned above, also had files added with current time-stamps. Needless to say, Remediation also worked fine afterwards.